The United States Wrestling Association (USWA) was a professional wrestling promotion based in Memphis, Tennessee. The company was founded when the Memphis-based Continental Wrestling Association merged with the Dallas-based World Class Wrestling Association. The USWA was founded as an attempt to create a third national promotion, alongside Jim Crockett Promotions/WCW, and the WWF (now known as WWE). 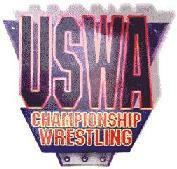 The USWA was created through a merger of the WCCW (from Texas) and the CWA (based in Memphis). It originally promoted shows, usually headlined by Jerry Lawler, in both Tennessee and Texas. The Dallas promotion (formerly WCCW), which was 40 percent owned by the Von Erich family, withdrew from the USWA in September 1990 due to a revenue dispute. According to Skandor Akbar, there were lawsuits involved, most notably when Jerry Jarrett was sued by Kevin Von Erich. That promotion reverted to the World Class name, but ceased operations two months later due to lack of revenue. Jerry Jarrett and Jerry Lawler brought the USWA back to Texas, but only on a limited basis, while promoters Joe Pedicino, Max Andrews, and Boni Blackstone were getting the new Global Wrestling Federation ready for a spring 1991 debut at the Sportatorium. Several of the former World Class and USWA Dallas wrestlers joined the new GWF, while others from the old CWA remained with the USWA. In 1992, the USWA began a talent exchange with the WWF, which saw Lawler sign on to Vince McMahon's federation, while several high-profile WWF stars appeared in the USWA. Dallas wrestler Gentleman Chris Adams spent a few months in the USWA in an angle involving Brian Christopher and Toni Adams, splitting his time between Memphis and Dallas' GWF during this time frame. The wrestling landscape changed in 1995 - the Monday Night Wars began, with WWF and WCW battling for cable television supremacy on Monday nights each and every week. As for the USWA, their biggest crowds came every Monday night at the Mid-South Coliseum in Memphis, Tennessee. With a growing wrestling viewership on Monday nights that could watch pay per view-quality wrestling matches for free on television, the live attendance at the marquee events for the USWA began to dwindle. A move to Thursday nights did not help what was becoming inevitable - the demise of the USWA. A combination of a poor line up, sub-standard venue, lack of talent and holding the show on a Thursday night led to a show on October 3, 1996 drawing the smallest crowd in the history of Memphis wrestling: just 372 fans, paying $1,800, to the Big One Flea Market. The future of the promotion was being questioned, following the previous week's resignation of general manager Randy Hales. The Louisville and Nashville crowds had stayed consistent, but the Memphis crowds, which in the past had carried the promotion, had fallen over the past few months. In addition, the Big One (Flea Market) pavilion was less than inviting, the zigzag roof of its original owner (The Treasury Stores) causing its major leaking problem. Although Lawler was working for the WWF, he and Larry Burton ended up buying the USWA from Jarrett and immediately selling it to businessman Mark Selker's company XL Sports Ltd. in early 1997, and the USWA went out of business by November of that year, resulting in a nasty lawsuit between Burton, Selker, and Lawler. In a civil RICO trial, a Federal District Court jury in Cleveland, Ohio eventually returned a verdict on which judgment was entered. The jury determined that Larry Burton and his son Jason Bertman had engaged in racketeering and awarded XL Sports treble damages in the amount of $2,595,000. The jury also determined that Mr. Burton was liable for fraud and conversion, and awarded XL Sports $235,000 in compensatory damages and $3,300,000 in punitive damages. The United States Court of Appeals for the Sixth Circuit upheld all these judgments. ^ "U.S.W.A. Unified World Heavyweight Title". Puroresu Dojo. 2003. Retrieved 2007-10-09. ^ "U.S.W.A. Southern Heavyweight Title". Puroresu Dojo. 2003. ^ "U.S.W.A. Tag Team Title". Puroresu Dojo. 2003. ^ "U.S.W.A. Texas Heavyweight Title". Puroresu Dojo. 2003. ^ "U.S.W.A. Television Title". Puroresu Dojo. 2003. ^ "U.S.W.A. Women's Title". Puroresu Dojo. 2003. ^ "U.S.W.A. Junior Heavyweight Title". Puroresu Dojo. 2003. ^ "Big Business Brown's website". Big Biz. Retrieved 2012-01-01.